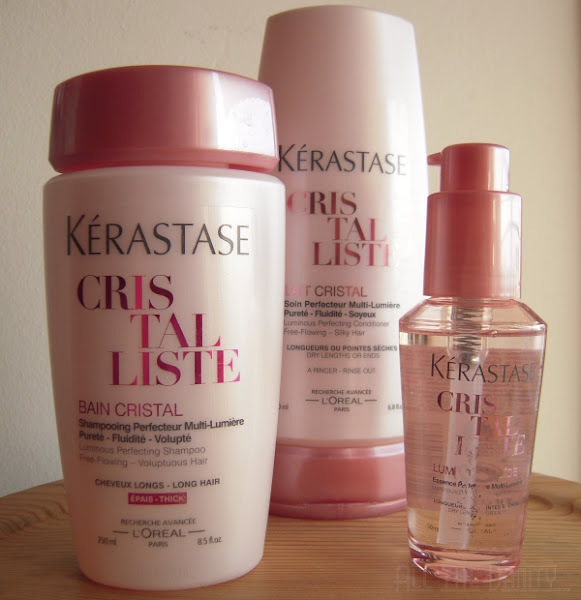 Kérastase Cristalliste: my thoughts on the range! If you follow my blog for some time now, you know that my hair is fine, dry and overprocessed due to the frequent highlights and heat styling that I put it through. In other words, fighting frizz, keeping the ends as moisturised as possible and adding shine are at the top of my haircare "worries". This means, of course, that I'm always game to try any new haircare products that promise to help my dry, damaged locks and improve their appearance. So, I was especially excited to have been given the chance to try the new Cristalliste range by Kérastase. 1. Cristalliste Bain Cristal Luminous Perfecting Shampoo. As you can see, I was sent the one for thick hair and I was initially afraid that this would somehow result in making my hair limp and lifeless, but, fortunately, that wasn't the case. Bain Cristal is a clear gel formula: at first it reminded me of deep cleansing shampoos, but I haven't noticed any unusual dryness, after many weeks of use. It lathers nicely, though you do need to lather up for a second time to get that ultra clean feeling, but I feel that this is the case with most shampoos anyways. It didn't really do much for my dry ends, but it didn't dry them out even more either and it left me with an overall feeling of clean hair, with a bit more volume than before. 2. Cristalliste Lait Cristal Luminous Perfecting Conditioner. Truth be told, I'm a bit indifferent towards this conditioner: I expected something more nourishing than this. I don't feel that it's a particularly unique conditioner, but I did enjoy that it rinses out super quickly and that I didn't have to spend 10 minutes under the shower to get it off my hair. 3. Cristalliste Lumiere Liquid. The best had to be saved for last: hands down the best serum I've ever tried! Lumiere Liquid is a very runny serum, that adds tons of shine to your hair, without weighing it down at all, and without that unpleasant feeling of hair "coated" with product. I literally can't feel this stuff when I put it on, and it doesn't make me want to wash my hair more often. I use a tiny amount before a blow out, as I've discovered that it helps with detangling, and another small amount after I'm done, and the result almost reaches that "hair that's been freshly dyed" glossiness. It's such a light consistency, that I don't really have to wash my hands after applying it, which, for me, is a first for a serum! ***A few words of warning though: the ingredients in this (silicones and alcohol) are probably quite harsh for those with similar hair to mine (even though you won't be able to feel it), and could worsen the dryness with frequent use. I've learned a long time ago that daily use of silicone serums on dry hair is a no-go, and as sad as I am not to be able to use this every day, hair health trumps hair appearance in my book. Overall thoughts: the Cristalliste range does what it says, and despite me not being super wowed by it (apart from the serum), my hair seems to be lighter and more volumised. What's interesting, is that I've not experienced any frizziness while testing this range out, but then again, it's not a particularly rainy season at the moment, and I didn't go to any humid beach clubs, so I can't really say if it's all due to the products or not. I still need the occassional oil treatment and the weekly mask to complete my hair routine, but all in all, I'm happy with my haircare at the moment. It also left me to consider if all the heavy conditioners, masks, and oils have been doing my hair a disservice all these years, since this lighter range has given me equally good results. Unless it's just a coincidence, in which case the fall humidity will give me the answer. So, would I restock when I run out? Not really, if we're talking about the conditioner. Have you tried anything from the Cristalliste range, and what are your thoughts on it? What's your approach to haircare? Do you find that heavier, thicker keratin formulas aren't really that beneficial? Agreeeeeeeee wouldnt repurchase.. maybe the serum. Wouldnt say no if it was a gift but there was no wow! Great review on the Kérastase hair care line. I didn't know that using silicone based hair products could make your hair drier in the long run - I'll have to start paying more attention to the ingredients in the hair serums that I use. I haven't tried any Kérastase hair products before, but I'm quite big on hair serums for detangling, shine and moisture so I'll have to remember this serum when I run out. @Karen Law: Anything with a -cone (and -ane if I'm not mistaken at this hour of the night) just coats the skin or hair in order for it to look good, but doesn't really penetrate or do anything beneficial! Lately I'm a lot more into ingredient research than I used to be, it helps in knowing what you're paying for! The Crystalliste serum was the one that stood out from the rest of the range, truth be told! i love the shampoo , i have the one for fine hair do . The conditioner is okay , and the serum is ok but over time is dried out my hair because it contains alcohol so i stopped using it . great review ! "Basically I needed a couple of brushes..."
Thinking ahead: my pre-fall beauty wishlist!